The Galápagos Finches: Evidence for Evolution? The Galápagos Islands are home to a famous group of birds called “Darwin’s finches.” Most taxonomists view these finches as belonging to thirteen separate species within four (or three) genera of a single family (or subfamily). All of the Galápagos finches are thought to have descended from one or a few pairs of ancestral birds that strayed from the South American mainland. Collected by Charles Darwin during his Beagle voyage, these finches have long been featured as significant examples of evolution. They are typically exhibited as a notable instance of “adaptive radiation,” which is defined as the relatively rapid production of a number of new species from a small ancestral population expanding into unoccupied niches, especially thought to occur on isolated islands (see, for example, the high school biology text by Mader, pp. 522-523). But recently, as a result of the diligent and extensive field work of Peter and Rosemary Grant of Princeton University, “Darwin’s finches” have become more important than ever as proof that evolution happens. Jonathan Weiner’s well-written book The Beak of the Finch won the 1994 Pulitzer Prize for non-fiction, and brought to public attention the (alleged) exciting confirmation of Darwinian evolution provided by the work of the Grants and their team. Weiner claims that in light of the Grants’ studies, the Galápagos finches now constitute the Number One example of evolution in action. “. . . the Grants’ work on Darwin’s finches . . . is one of the most intensive and valuable animal studies ever conducted in the wild. . . . It is the best and most detailed demonstration to date of the power of Darwin’s process” (p. 9). Weiner quotes William Hamilton, evolutionist at Oxford University: “I think it can be claimed that the work as a whole gives the most detailed unified support to the Neo-Darwinian view of evolution that the theory has yet received” (p. 19). As Weiner enthuses, “The beak of the finch is an icon of evolution” (p. 112); ” … these birds have become … a universal symbol of Darwin’s process, so that their beaks now represent evolution the way Newton’s apple represents gravity” (p. 134); the Galápagos finches are “paragons of Darwin’s theory” (p. 154). (a) The various “species” are known to interbreed. The biological species concept was defined by two noted contributors to neo-Darwinian evolutionary theory, ornithologist Ernst Mayr and geneticist Theodosius Dobzhansky. According to this concept, species are “groups of actually or potentially interbreeding natural populations, which are reproductively isolated from other such groups” (quoted in Price, p. 51). In light of this definition, which makes excellent operational sense especially for currently-living, sexually reproducing organisms such as birds, consider the following results as discussed by Weiner. The Grants’ team, focusing primarily on finches of the genus Geospiza on the island of Daphne Major, discovered that various “species” not only interbreed but do so highly successfully. For example, a male G. scandens crossed with a female G. fortis, producing four children, 46 grandchildren, and “a lot of great-grandchildren” — “That does not make them all-time champions on Daphne Major, but it puts them high” (Weiner, pp. 120-121). In another instance, a male G. fortis mated with a female G. fuliginosa, and “bred very well;” the female “outproduced all others of her kind” (p. 123). Such successful crosses are by no means unusual: “Roughly one out of ten of the finches born on the desert islet of Daphne Major now are hybrids, and the hybrids are doing better than any of the others on the island” (p. 206). “Strange as it seems, these hybrids are the fittest finches on the island” (p. 125). These finches are clearly not showing themselves to be different species: “Life would be so much simpler if lines of animals would only keep to themselves, [evolutionist Jeremy] Searle writes, only half-jokingly. That should not be too much to ask: it is the zoologist’s standard working criterion of a good species . . . . ‘It is disappointing that even Darwin’s finches do not seem to quite fit the bill.’ ” (Weiner, p. 201). For all we know, the “inter-specific” matings may be even more widespread than observed to this point: “. . . Darwin’s finches have been one of the best-studied groups of birds in the world for most of this century. Yet it is only now, after this extraordinary watch, involving generations of birds and generations of graduate students, that the extent of the mingling of genes among Darwin’s finches has come to light” (pp. 198-199). David Lack, the noted British investigator of these birds during the mid-twentieth century (to whom the Grants dedicated their recent book), had searched for evidence of hybridization but found none (Grant and Grant, 2008, p. xviii). Even now, “the interbreeding potential of allopatric populations is not known” (p. 165). In addition to observations of widespread matings among Geospiza species, however, it is significant that there is also some evidence for interbreeding between finch genera Camarhynchus and Certhidea (p. 93). As Weiner puts it, “Darwin’s finches can interbreed and produce fertile young, but something keeps most of them from doing it. The barriers around the birds are invisible because they are created by the creatures’ own behavior. It is not anatomy but instinct that holds them apart. To inquire into the origin of species is to inquire into the formation of these instinctive, invisible barriers” (p. 159). But such “barriers” have clearly not produced true reproductive isolation. Notably, all Galápagos finches have similar courtship behaviour (Grant and Grant, 2008, pp. 76, 91). Their songs differ, but these are “learned and not genetically encoded” (p. 79); they are part of the young finches’ “cultural inheritance” (p. 111). A female “hybrid” will tend to choose a mate that sings the female’s father’s song type (p. 101). “Reproductive isolation in Darwin’s finches is apparently solely a phenomenon of divergence in courtship signals and responses” (p. 103). “. . . if all the finches on the Galapagos are merely members of the same species, then there is no meaningful sense in which they can be held up as an example of ‘evolution in real time.’ . . .
“The Grants recorded many other pairings of ‘different species’ of finch, which like [ornithologist David] Lack before them, they dubbed ‘hybrids.’ But of course the central significance of this finding is that the identification of the thirteen varieties as different species is impossible to maintain once it is admitted that they can interbreed and produce fertile young. (b) The various “species” appear to intergrade and are often indistinguishable. Under the morphological species concept, taxonomists can use anatomical differences to define species (especially when data on sexual reproduction are unavailable). But for Darwin’s finches, this approach turns out to be no less problematic than the biological species concept. As Weiner points out, the various finch “species” exhibit significant morphological overlap. “There are thirteen species of finches in the Galápagos. Some of them look so much alike that during the mating season they find it hard to tell themselves apart. Yet they are also spectacularly and peculiarly diverse” (Weiner, p. 17). 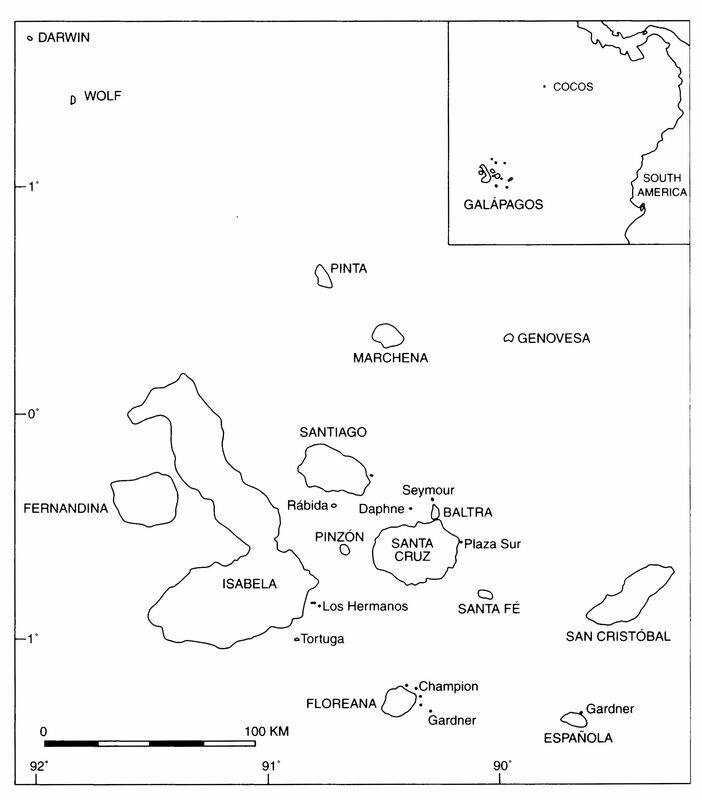 “The thirteen Galápagos finches are . . . an inextricable chaos of varying links. Darwin never knew how many links there really are, the chaotic and almost continuous variation in his Galápagos finches, but he got an inkling of the problem when he watched the experts struggle with them. . . . Taxonomists can be classified into splitters and lumpers. Faced with the diversity of Darwin’s finches, some splitters recognized dozens and dozens of species and subspecies. Some lumpers went so far as to call them all a single species” (pp. 40-41). “Within each of these three species [of ground finches studied by the Grants], the beaks of individual birds are variable. That is, they blur together. . . . For instance, the species in the middle of the trio, the medium ground finch, [Geospiza] fortis, sometimes shades into the species above it, magnirostris, or the species below it, fuliginosa. The very biggest specimens of fortis are just as big as the very smallest specimens of magnirostris, and so are their beaks. At the same time the very smallest specimens of fortis are just as small as the biggest fuliginosa, and so are their beaks” (p. 42). Darwin himself, in his 1839 journal, noted “a nearly perfect gradation” in the beaks of these birds (cited in Grant and Grant, 2008, p. 1). “It is very difficult for an objective observer to see how a group of finches who ‘find it hard to tell themselves apart,’ and who do in fact interbreed, can legitimately be called different species. What is the basis of this identification? As well, it has been demonstrated that even at the molecular level, the various “species” of Geospiza are indistinguishable. Studies involving both nuclear and mitochondrial DNA were unable to separate finches of this “genus” into their six “species.” This result is “uncharacteristic of nearly all other avian species and genera. . . . there is little evidence for clear species limits within Geospiza . . . irrespective of whether one uses biological, phylogenetic, genealogical, or evolutionary species concepts. . . . [It might be that] each genus is [just] a polymorphic species” (Zink, pp. 867-868). (c) The observed “evolution” of the finches is simply fluctuation about a mean. The Grants observed that drought conditions led to larger average weight, wingspan, and bill size, whereas flooding experienced a few years later resulted in reduced measurements: “Everything the drought had preferred in size large . . . the aftermath of the flood favored in size small” (Weiner, p. 104). Rather than continuing “to shoot like an arrow in the same direction” (p. 104), evolution had turned back. “Natural selection had swung around against the birds from the other side. . . . Selection had flipped. . . . Not only can evolution push a species fast in one direction. Evolution can reverse direction and push it back just as swiftly” (pp. 104, 106). In discussing another researcher’s results with song sparrows, Weiner makes a comment that applies also to the finches: “Summed over years, the effects of natural selection were invisible” (p. 108). It is “not surprising,” therefore, that “when Darwin looked at the fossil record, he saw it static and frozen for long stretches” (p. 109). Such “wobbling” back and forth is not evidence for macroevolution; there is no significant long-term directional change here. “. . . biologists have documented a veritable glut of cases for rapid and eminently measurable evolution on timescales of years and decades. “However, this plethora of documents—while important for itself, and surely valid as a general confirmation for the proposition that organisms evolve—teaches us rather little about rates and patterns of evolution at the geological scales that build the history and taxonomic structure of life. The situation is wonderfully ironic—a point that I have tried to capture in the title of this article. . . . to be visible at all over so short a span, evolution must be far too rapid (and transient) to serve as the basis for major transformations in geological time. Hence, the “paradox of the visibly irrelevant”—or, if you can see it at all, it’s too fast to matter in the long run. . . .
“Perhaps the firmest and most elegant examples involve a group of organisms named to commemorate our standard bearer himself—Darwin’s finches of the Galápagos Islands, where my colleagues Peter and Rosemary Grant have spent many years documenting fine-scale evolution in such adaptively important features as size and strength of the bill (a key to the mechanics of feeding) as rapid climatic changes force an alteration of food preferences. This work formed the basis for Jonathan Weiner’s excellent and best-selling book, The Beak of the Finch—so the story has certainly been well and prominently reported in both the technical and popular press. “Nonetheless, new cases of such short-term evolution still maintain enormous and surprising power to attract public attention—for interesting and instructive, but utterly invalid, reasons as I shall show. . . . The Galápagos finches serve as a fascinating example of natural selection in action, as do the well-known peppered moths. However, the detailed observations of the Grants have documented nothing more than “microevolution,” or (to use creationist terminology) variation within a created kind; macroevolution has received no empirical support whatsoever. More than this, the recent studies would appear even to have cast serious doubt on the value of the finches as a prime example of “adaptive radiation,” since these “species” are very difficult to distinguish on the basis of morphology, and highly successful interbreeding among them has been repeatedly noted. Gould, Stephen Jay. 1998 (Dec -Jan). “The Paradox of the Visibly Irrelevant.” Natural History 106(11):12-18, 60-66. Grant, Peter R., and B. Rosemary Grant. 1992 (Apr 10). “Hybridization of Bird Species.” Nature 256:193-197. ———. 2002 (Apr 26). 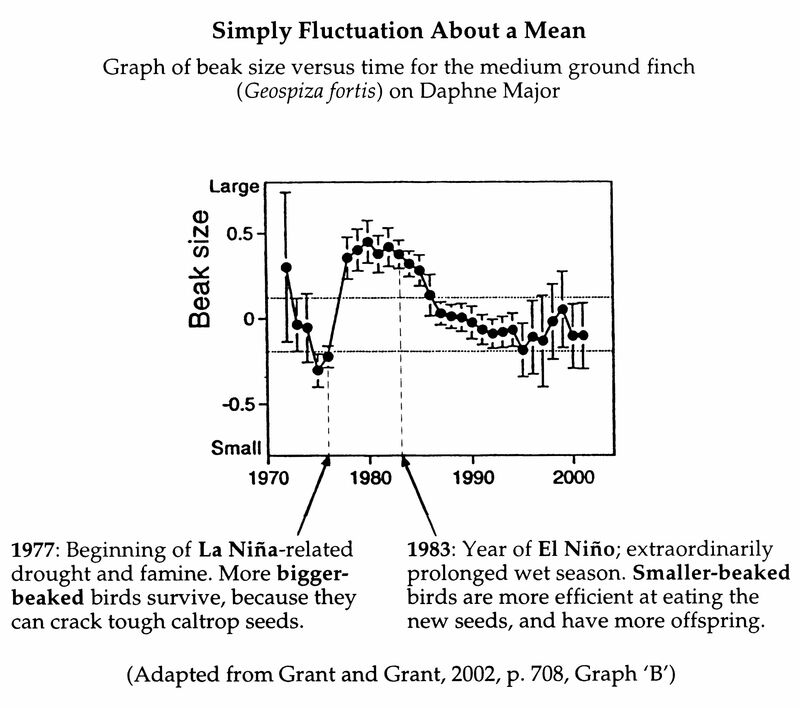 “Unpredictable Evolution in a 30-Year Study of Darwin’s Finches.” Science 296:707-711. ———. 2003 (Oct). “What Darwin’s Finches Can Teach Us about the Evolutionary Origin and Regulation of Biodiversity.” BioScience 53(10):965-975. ———. 2008. How and Why Species Multiply: The Radiation of Darwin’s Finches. Princeton, NJ: Princeton University Press. Johnson, Phillip E. 1997. Defeating Darwinism by Opening Minds. Downers Grove, IL: InterVarsity Press. Lammerts, Walter E. 1973. “The Galapagos Island Finches.” Why Not Creation? Grand Rapids: Baker Book House. Mader, Sylvia S. 1988. Inquiry into Life. (5th edition). Dubuque, Iowa: Wm. C. Brown Publishers. Milton, Richard. 1997. Shattering the Myths of Darwinism. Rochester, VT: Park Street Press. Price, Peter W. 1996. Biological Evolution. Orlando, FL: Harcourt Brace. Weiner, Jonathan. 1995. The Beak of the Finch. New York: Vintage Books. Zink, Robert M. 2002 (Jul). 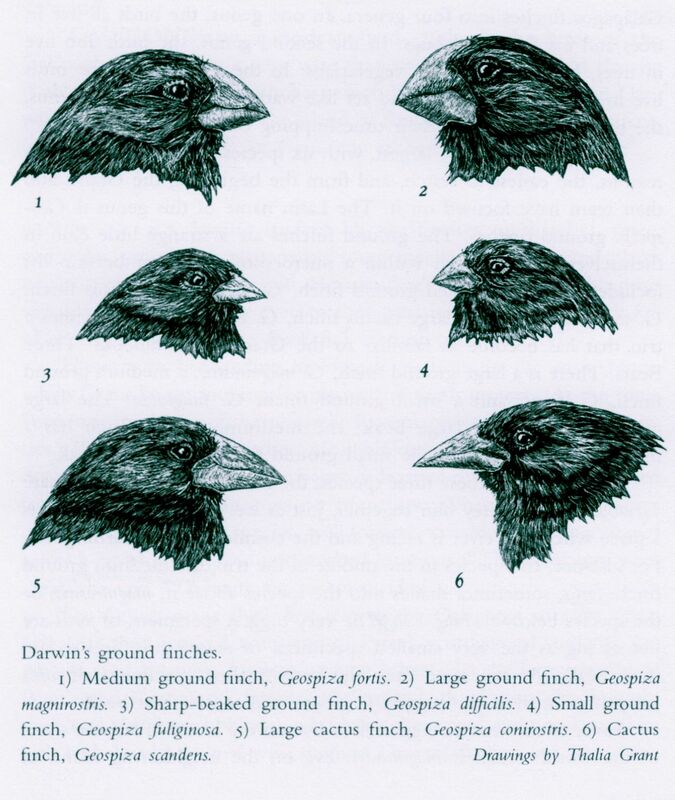 “A New Perspective on The Evolutionary History of Darwin’s Finches.” The Auk 119(3):864-871. See also Robert M. Zink, “Darwin’s Finches: Multiply and Subtract.” 2009 (Jan). BioScience 59(1):86f. This article restates and summarizes many of the unusual aspects of the finch story as a putative paradigm of evolution and adaptive radiation: “there is little about the finches that fits the classic model. . . . species overlap in phenotypic space, and many congeners are difficult to tell apart in the field and in the museum. . . . considerable hybridization. . . . molecular data fail to discriminate most of the species in the two main genera (Geospiza and Camarhynchus). . . .” Zink holds a chair in ornithology at the Bell Museum, and is a professor of ecology, evolution, and behavior at the University of Minnesota in St. Paul.